Hey y’all – welcome to November and this month’s blog theme – embellish! 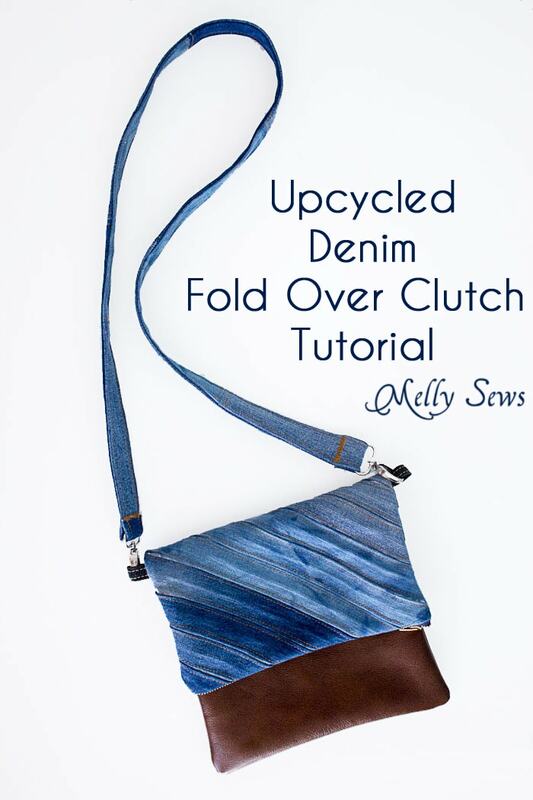 Today’s project uses recycled denim as an embellishment to make this fold over clutch. 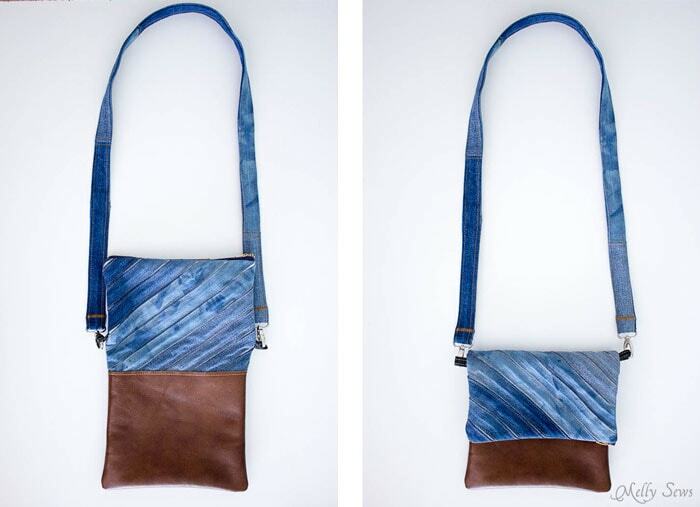 And with an optional cross body strap added, this bag is unique, stylish and functional. Denim. All of the denim I used came from the legs of jeans that I had turned into cutoff shorts. 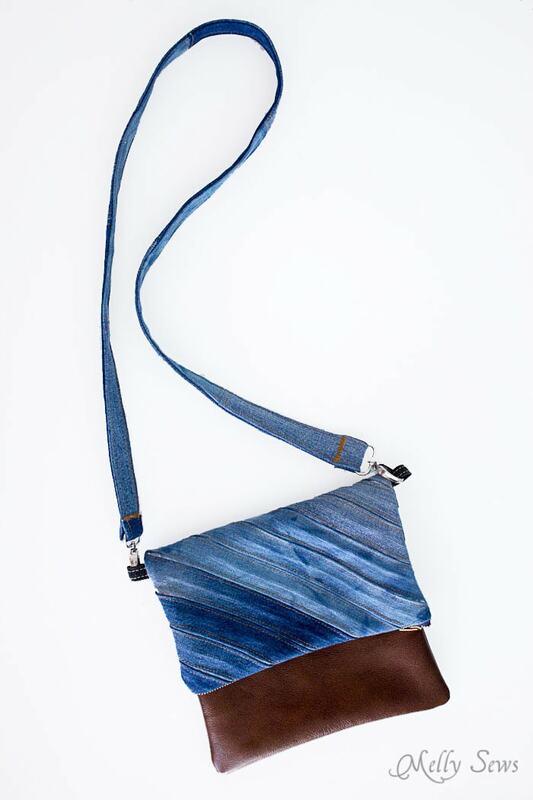 I used legs from 4 pairs of jeans for my pouch, and I had some strips left over. To start, I cut a bunch of 2 inch wide strips of denim. Since some of the jeans were mine and some came from the boys, I had all different lengths and different colors. Next I ironed those strips as you would for single fold bias tape – pressing both raw edges toward center on the back of each strip. Then I cut two 10 by 8 1/2 inch pieces of the muslin backing, and arranged denim strips over them, making sure the ends of the strips went beyond the backing before cutting them. Stitch around the edges of the backing to sure the strips at the perimeter, then use your twin needle and the heavy duty thread. Tip – wind your topstitching thread onto a bobbin so that you can thread both needles with the heavy duty thread and only have to buy one spool. 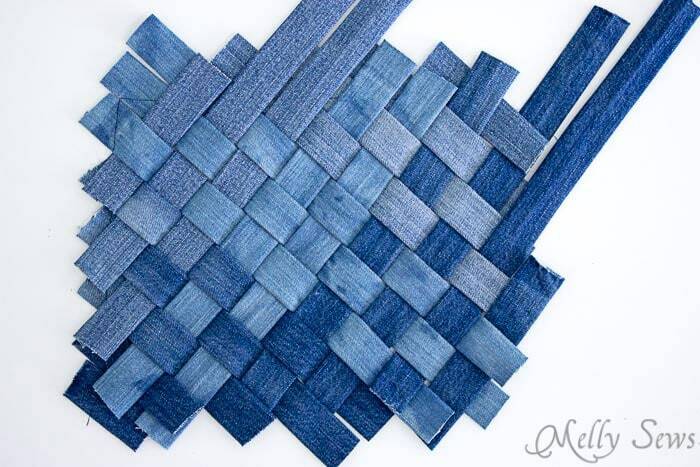 Side note: my original plan was to weave the denim strips as I show below, but I didn’t love the look as much. But if you wanted to do this, the topstitching wouldn’t be as necessary because tight weaving would hold the strips in place. 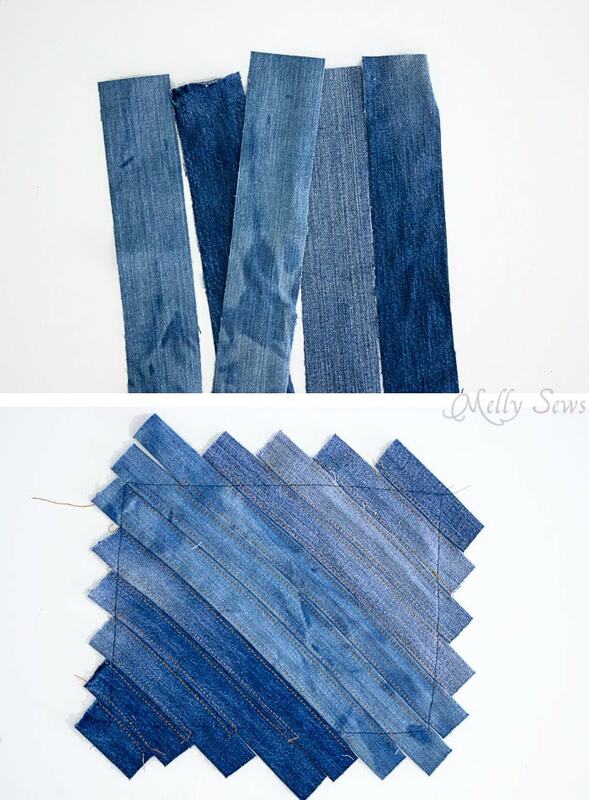 Trim the denim strips around the edges, to make a 8 1/2 inch by 10 inch rectangle. They should be even with the edges of the backing. Overlap your leather pieces slightly over the denim pieces along the long edges, then sew, using a leather needle and the heavy duty thread. Tips for sewing leather here. However, I’ll add another tip. My machine was having a hard time with the denim and leather, and it worked much better when I put the heavy thread in my bobbin, used a regular thread in the top, and sewed with my leather against the feed dogs and my denim layer against the presser foot. 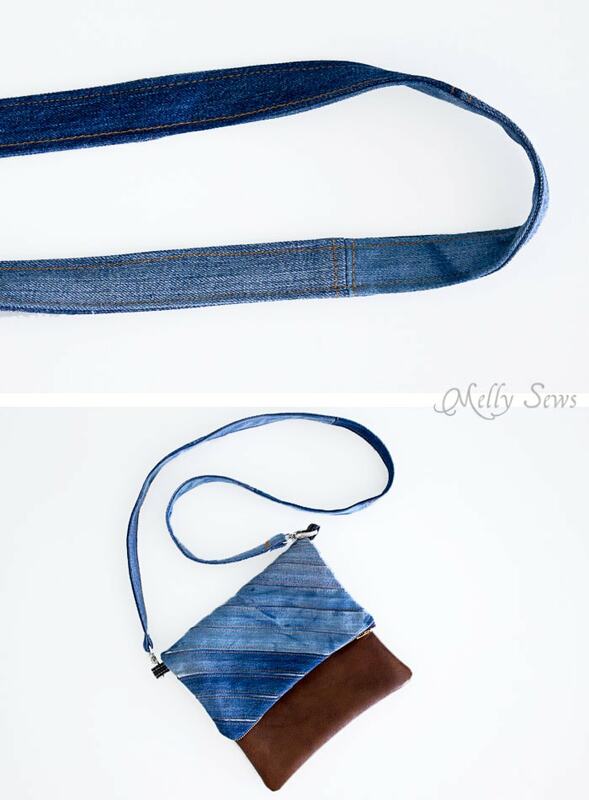 Next, use the denim scraps to make 1/2″ wide strip that is about 8 inches long; do this the same way you made the strips on the purse. Topstitch the 1/2 inch strip, then cut it in half so you have two 4 inch by 1/2 inch strips. 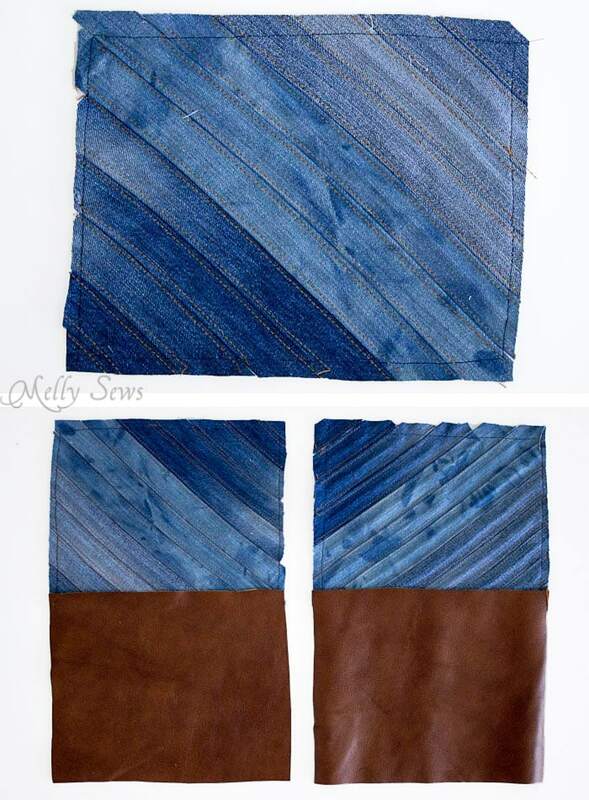 Fold those in half and clip to each side of one denim/leather fabric assembly with the folded side toward center. You want 1/2″ of the loop to stick beyond the seam allowance. Baste in place and cut off excess. 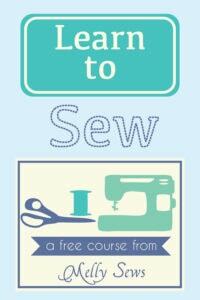 Follow the instructions in this post to sew the zipper pouch. Use the heavy duty thread in the upper thread, regular thread in the bobbin, the 100/14 needle and a increase the stitch length on the leather side. 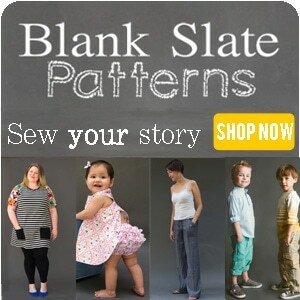 Next, take more of the denim strips and stitch them short ends together to make two 50 inch long strips. Topstitch the seam allowances open and flat on the strips, then refold the strips. 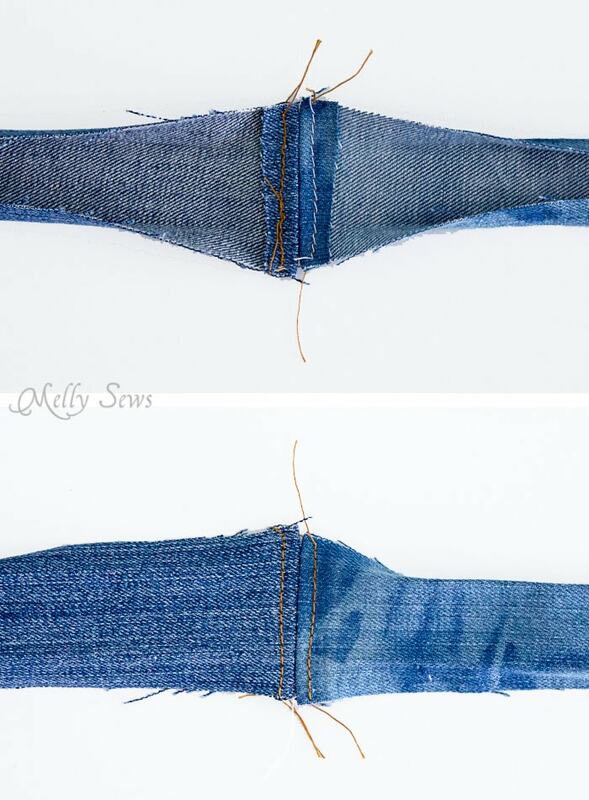 Place them wrong sides together, staggering the seams, and load both your bobbin and top thread with the heavy duty thread, then stitch along the edges to form the strap. Because of staggering the seams, you will end up with extra at the ends of the straps; just make sure that the finished part of the strap is at least 45 inches long. Fold the edges of the strap around the D rings on the clasps, and zig zag with the heavy duty thread over the raw strap edge and you’re done! Add the strap to your clutch and fold over the top. This is a perfect size to carry essentials, and since the top folds over, you can actually expand it by unfolding when you need a little more room. 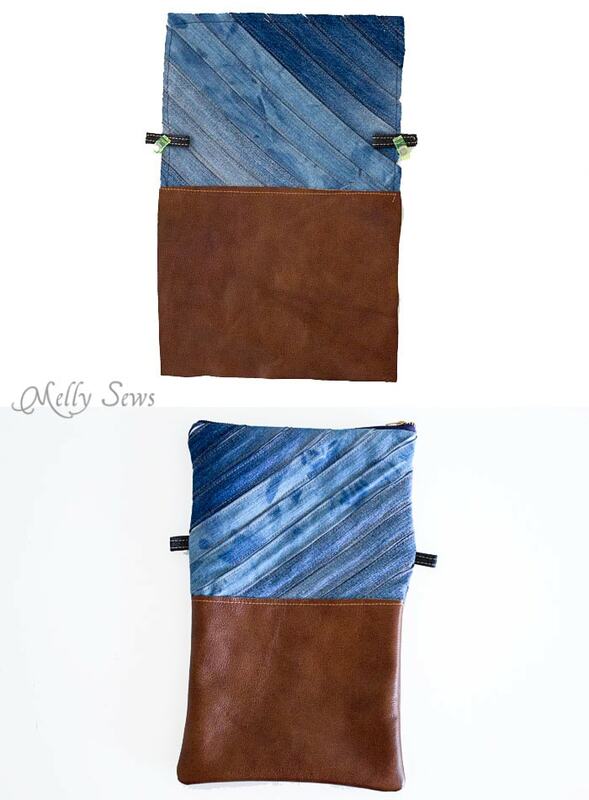 And of course, you can also make these in any kind of fabric – it doesn’t have to be the denim and leather I used. Very nicely done!! – You might want to sell them online 🙂 They will sell a lot.